According to the Spanish defense ministry, the merchant ship was freed in the Gulf of Guinea on April 9. As explained, the unnamed vessel displayed unusual behavior and did not respond to radio contacts, prompting the Spanish Navy ship Serviola to carry out an inspection. 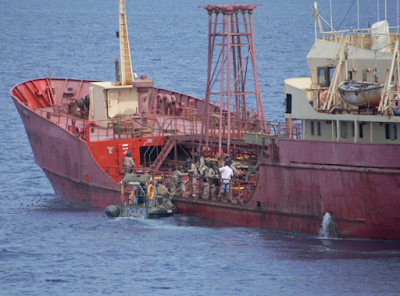 As the navy crews were approaching the vessel in rigid hulled inflatable boats, the pirates fled. The nine perpetrators were reportedly armed with AK-47 rifles and grenade launchers. The authorities further said that the pirates robbed the ship’s Nigerian crew in addition to looting a portion of the ship’s provisions.